Before going through documentation chapters, thanks for purchasing PrivateContent Premium Plans add-on and trusting LCweb! PrivateContent plans are totally removed from your webite. It applies to any plan and is stored individually for every user. Then if you increase trial period, it will be applied only to new users. Bulk applies a plan to existing users not associated with the add-on. Remember you can do it individually in "edit user" page. Be careful: newly associated users will be put in "unpaid" status and need to pay to login in PrivateContent again. By default existing users aren't involved in add-on checks. This means they will still be able to login. Is possible to associate a plan globally in Premium Plans add-on settings or individually editing an user. Then only users with active or trial status can login into PrivateContent. Assigned plan, status and expiration date can be changed in "edit user" page. Here you can also check user orders history and eventually delete past orders. However status depends also from user's active order status (active order is the first one shown in table, in previous image). 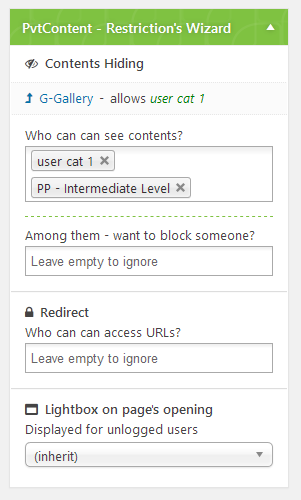 Already existing users can be associated to plans directly in "edit user" page, individully. Otherwise in Settings page there's a little wizard to bulk assign a plan to any not-associated user. Then, they have to pay for their subscription in order to keep logging into PrivateContent. Premium Plans add-on has got an automated subscription's renewal system. This means as soon as user has got expired status, in login message they will be able to create a new order and pay it, without delays. Then, by default, renew will be performed on same plan. However, in settings, you can change this behavior and allow plan's change. Creating plans you will be able to set specific restrictions requiring them, or also define further restrictions on an already restricted page. Each category-selection dropdown used to specify some restriction will now have plans listed. This page has been restricted to be visible by "User Cat 1" users OR belonging to "intermediate level" plan. This is valid across any category-based restriction system and using pc_user_check() API function. Then is automatically integrated in categories, pages, posts, menus and widget restriction wizards. Obviously also in privateContent shortcode. Prints currently logged user's plan expiration date. The optional date_format parameter can be used to specify a different date format from your website's global one. You must use PHP syntax. Prints currently logged user's plan expiration countdow. For example if plan is gonna expire in 14 days, it will return "2 weeks"
Otherwise: go in the plugin folder, you'll find a folder called "languages".